Last week, Sally and I were talking about our Thanksgiving menu. She isn’t afraid to step out of the box from your “traditional” Thanksgiving menu items. We have a few staples like macaroni and cheese, which are always on the menu, but every year Sally likes to try out new dishes and add them to the rotation. 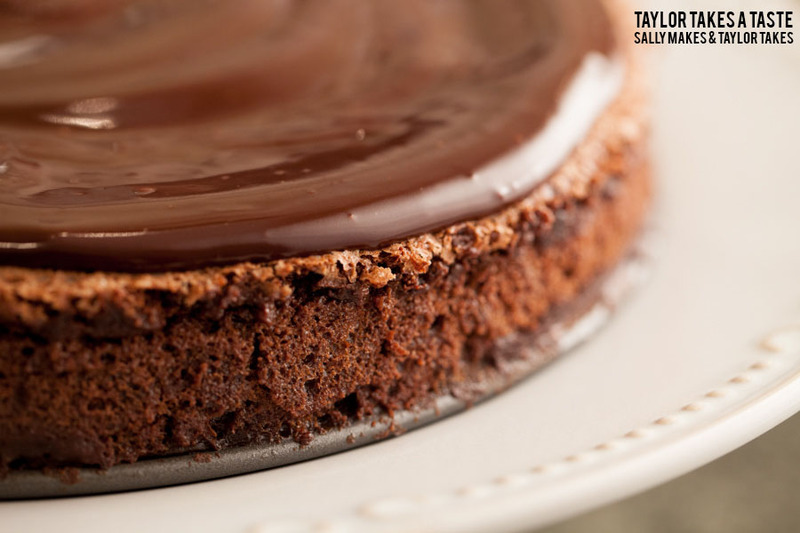 This year, she had the idea for a rich chocolate flourless cake covered in a thick chocolate ganache. The word flourless had me thinking. She read out the ingredients from the piece of white printer paper where she had jotted down her recipe, “bittersweet chocolate, eggs, butter, granulated sugar, dark brown sugar, vanilla, espresso, salt and heavy whipping cream.” She said, “ Yes, looks like this cake lacks any gluten.” The ingredients were gluten free, but what about the preparation for the pan? When you butter and flour a pan that flour will have gluten in it. Sally’s solution was to use cocoa powder! Genius! Preparing a spring form pan with butter and cocoa powder will not only prevent the cake from sticking to the pan, but it will also keep the beautiful dark brown chocolate color on the sides of the cake. Neither Sally nor I practice a gluten free lifestyle, but we both know people who do. It’s difficult and sometimes awkward when you entertain and you forget that one of your guests are gluten free. Has a situation like this ever happened to you? A few weeks ago, my wife, Sara, and I had a friend who’s husband was out of the country on a business trip. We decided to have her over and prepared a chicken satay and an apple crisp for dessert. We made more than the three of us could eat, so we decided we would invite another one of our friends over. Right before Sara pressed send on the text invitation, she realized a huge problem. This friend practiced a gluten free lifestyle and we were about to serve her chicken that was marinated in soy sauce and a dessert whose topping was loaded with flour. The food was already prepared, so we decided not to invite her due to the fact that we had nothing to serve her and didn’t want it to be awkward or make her feel obligated to eat something that would make her feel bad. It was an unfortunate situation, but is one that I am sure you probably have experienced yourself. 1.Preheat the oven to 325 degrees. Break 10 ounces of chocolate into small pieces. Put the chocolate into a large heat-proof bowl. Set the bowl over a pan of simmering water and stir occasionally until the chocolate is melted. Off the heat, add the butter and stir until it melts into the chocolate. Set the chocolate aside to cool. 2. Put the eggs into the work bowl of a stand mixer. Beat on medium low speed. Add the sugars, vanilla, espresso powder and salt. Raise the speed to medium high and beat the egg and sugar mixture for 10 to 12 minutes or until the mixture is thick. While the egg and sugar mixture is mixing, butter the top and sides of an 8 inch springform pan. After buttering, line the bottom of the pan with a disk of parchment. Butter the parchment. Line buttered pan with a thin layer of coco powder. Set pan aside.Put about 2 quarts of water into a saucepan and bring to a simmer. 3. Add the cooled chocolate and butter mixture to the beaten egg mixture. Mix on low speed until the ingredients are just blended. Turn off mixer. Line the bottom and sides of the prepared springform pan with foil wrap. Set the foiled pan into a high sided baking dish large enough to hold the cake. Pour the cake batter into the prepared pan. Fill the baking dish with simmering water about 2/3 of the way up the side of the springform pan. Put the cake in the water bath into the oven. Bake the chocolate cake for 75 minutes. Remove the cake from the oven and place on a wire rack. 4. Cool the cake for 10 minutes. Run the edge of a knife around the sides of the cake. Loosen the clasp on the springform pan and remove the side of the pan from the cake. Continue to cool the cake on the rack until the cake is room temperature. Break the remaining 6 ounces of chocolate into large pieces. Place the chocolate and the heavy cream into a medium heat-proof bowl. Set the bowl over a pan of simmering water and heat until the chocolate melts, stirring occasionally. Remove the bowl from the simmering water and stir chocolate until it is smooth and glossy. 5. Put the cake onto a serving platter. Top the cooled cake with the melted chocolate. Let the cake sit until the chocolate has cooled. Serve cake or refrigerate until needed. I’m so glad I was introduced to your blog– I’m entertained, I’m finding new recipes, and I’m learning tips. Thank you and I hope you had a great Thanksgiving. Thanks Marisa! I am so glad to hear that you have enjoyed Taylor Takes A Taste!